The HomeWarming program helps a rural farmhouse feel as warm as the family memories it contains – and helps a senior couple save money on heating bills. In a small rural community in Cumberland County, Nova Scotia, Janice and Robert Sperry reminisce about the years spent raising their family in a century-old farmhouse. Photos of their first grandchild join the many others of their children, the walls of the house a quilt of memories. Two dogs bark outside near a vegetable garden. It’s a home full of love, but not always of winter warmth. And the Sperrys have the high heating bills to prove it. While full of laughter, the house could be cold. Over the years Robert improved the electric and water supply systems and did some minor insulating. They were able to do some insulation work themselves, but health issues, costs and the busyness of family life – Robert, a Navy veteran, and Janice, an active home-keeper, were both Scout leaders and volunteers in their community – kept them from being able to make major changes. 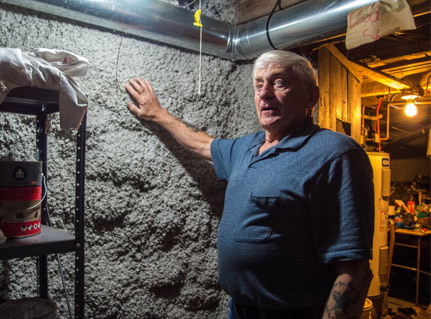 Robert Sperry describes the sprayform insulation added to the basement – the home is expected to be dramatically more energy efficient as a result of upgrades provided through the HomeWarming program. “We knew we needed to do more,” Janice explains. When the Sperrys learned about HomeWarming from a local contractor, they applied right away. Clean Foundation and Efficiency Nova Scotia work together to help income-qualified homeowners complete energy-saving home upgrades at no cost. The program is supported by Nova Scotia Power and the Government of Nova Scotia. “The HomeWarming program surpassed our expectations with the quality and extent of the work provided. And it’s going to make a big difference in the bills. The upgrades done to the Sperrys’ home – which include draft-proofing, installation of gyprock in place of old lathe and plaster, as well as insulation in the attic, basement, exposed floor and exterior walls – are expected to make their home nearly 60 percent more energy efficient. A well-insulated home is warmer in the winter and cooler in the summer. And more affordable in all seasons. Zenon Pilipowicz was the Energy Advisor assigned to the Sperrys’ home. Snow was up above the windows when he arrived to do the energy audit, so he knew there were cold spots. But HomeWarming doesn’t just go in and plug up all the holes. “A home is a highly connected system of parts,” says Zenon. “When multiple upgrades are involved, we need to understand how each upgrade affects the home as a whole, so they don’t have negative effects on indoor air quality.” In the Sperrys’ home, indoor air quality issues due to moisture have been resolved because new dehumidifiers keep basement moisture levels low. Both Robert and Janice look forward to feeling how the upgrades improve their home comfort over the cold winter months ahead. They also gained an improved understanding of how their home operates, and are better prepared to take on other home improvement projects.